This article will aid you to remove WeChat Pay Ransomware. Follow the ransomware removal instructions provided at the end of the article. WeChat Pay Ransomware is one that encrypts your data and demands money as a ransom to get it restored. The WeChat Pay Ransomware will leave ransomware instructions via a lockscreen instance. Keep on reading the article and see how you could try to potentially recover some of your locked files and data. Short Description The ransomware encrypts and demands a ransom to be paid to allegedly recover them. User Experience Join Our Forum to Discuss WeChat Pay ransomware. The reports about the Wechat Pay ransomware showcase that it is distributed mainly via supply-chain attack. By definition this is an attack intrusion that focuses on less-secure elements in a certain company’s infrastructure. Further information about the exact route of infection is not known at this stage. What we know so far is that this is devised as a special attack against Chinese targets. It is very possible that the route of infection is the installation of infected software package. Such tactics take the legitimate installers of popular applications which are often installed by end users: system utilities, creativity suites and productivity applications or even games. Once they are executed by the engine the WeChat Pay ransomware will be started. 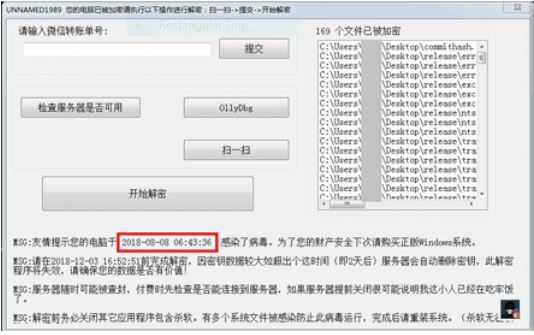 The distributed ransomware carriers have also been found to implement stolen digital certificates from Tencent Technologies. This explains the massive number of affected users which were reported at the onset of the attack campaign. The known information about the hacker or criminal group behind the WeChat Pay ransomware attacks is a nick name “Luo”. The researchers were able to follow their QQ account number, mobile number, email IDs and their Alipay ID. The WeChat service has suspended the identified account which should stop the attacks coming in with this configuration. As soon as the WeChat Pay ransomware is started it will start its built-in sequence of commands as per the current configuration. The analysis of the collected samples shows that one of the first components that are run is the password stealing one. It can scan the local hard drive, installed applications and the operating system environment for the following services: Alipay, NetEase 163 email service, Baidu Cloud Disk, Jingdong (JD.com), Taobao, Tmall , AliWangWang, and QQ. Data Theft — The service connection can be used to hijack user data before they have been encrypted. System Data Changes — Via this Trojan connection the criminals can manipulate the system by accessing and editing Windows Registry settings belonging both to the operating system and the third-party installed applications. This can result in the inability to launch certain functions or operations, as well as cause severe performance issues. Additional Malware Infections — If instructed so the WeChat Pay ransomware infection can lead to the delivery of other malware. Additionally the ransomware engine has been found to generate a report of the installed hardware components and other data that may be useful in analyzing the results of the attack campaign. The collected data may be used to generate a machine infection ID which is associated with every single compromised host. As soon as the prior components have completed execution the actual ransomware engine will be started. A lockscreen instance will then be displayed to the victims notifying them that they have to pay a ransomware fee of 110 yuan in order to get access back to their data. NOTE: A decryptor has been released for the captured early versions. You can attempt file recovery by using it. If your computer system got infected with the WeChat Pay ransomware virus, you should have a bit of experience in removing malware. You should get rid of this ransomware as quickly as possible before it can have the chance to spread further and infect other computers. You should remove the ransomware and follow the step-by-step instructions guide provided below. Threats such as WeChat Pay ransomware may be persistent. They tend to re-appear if not fully deleted. A malware removal tool like Combo Cleaner will help you to remove malicious programs, saving you the time and the struggle of tracking down numerous malicious files. Threats such as WeChat Pay ransomware may be persistent on your system. They tend to re-appear if not fully deleted. A malware removal tool like SpyHunter will help you to remove malicious programs, saving you the time and the struggle of tracking down numerous malicious files. Note! Your computer system may be affected by WeChat Pay ransomware and other threats. SpyHunter is a powerful malware removal tool designed to help users with in-depth system security analysis, detection and removal of threats such as WeChat Pay ransomware. 1. Install SpyHunter to scan for WeChat Pay ransomware and remove them. 2. Scan with SpyHunter, Detect and Remove WeChat Pay ransomware. Ransomware infections and WeChat Pay ransomware aim to encrypt your files using an encryption algorithm which may be very difficult to decrypt. This is why we have suggested several alternative methods that may help you go around direct decryption and try to restore your files. Bear in mind that these methods may not be 100% effective but may also help you a little or a lot in different situations. Note! Your computer system may be affected by WeChat Pay ransomware or other threats. Remove WeChat Pay ransomware by cleaning your Browser and Registry. Fix registry entries created by WeChat Pay ransomware on your PC. Combo Cleaner is a powerful malware removal tool designed to help users with in-depth system security analysis, detection and removal of threats such as WeChat Pay ransomware. Step 5: In the Applications menu, look for any suspicious app or an app with a name, similar or identical to WeChat Pay ransomware. If you find it, right-click on the app and select “Move to Trash”. Step 6: Select Accounts, after which click on the Login Items preference. Your Mac will then show you a list of items that start automatically when you log in. Look for any suspicious apps identical or similar to WeChat Pay ransomware. Check the app you want to stop from running automatically and then select on the Minus (“–“) icon to hide it. Remove WeChat Pay ransomware – related extensions from your Mac’s browsers. A pop-up window will appear asking for confirmation to uninstall the extension. Select ‘Uninstall’ again, and the WeChat Pay ransomware will be removed. When you are facing problems on your Mac as a result of unwanted scripts and programs such as WeChat Pay ransomware, the recommended way of eliminating the threat is by using an anti-malware program. Combo Cleaner offers advanced security features along with other modules that will improve your Mac’s security and protect it in the future.